It is our intention that through interacting with the Earthdance sessions, workshops, retreats and events you will find support, inspiration, empowerment and facilitation to get more in touch with your inner self and sense of ‘being’ and true potential. We have such an amazing group of beautiful people who have become part of the Earthdance family – or as I call it , ‘The Rainbow Tribe’. I was shown many years ago when my journey with Earthdance first began that part of my work was to help to bring the Rainbow people back together… this is why I feel that so many people say that they feel they have come into a family the very first time they attend an Earthdance session or retreat. It seems that there is certainly something bigger at play… as I work with my intuition always with what is asked of me to assist in any and every way I can to enhance each person’s experience and unfolding ‘Earthdance’ here, at this time and incarnation. Below is a verse that was given to me by a dear friend many years before Earthdance came about… I felt at the time it was given that it was very significant and would play a part in my work somehow in time to come… tucked away in a drawer only to be re-discovered as the visions came……. She facilitates spiritual/personal awareness and development…. assisting people to realise their innate gifts and true potential. Roz has over 20yrs experience leading a wide range of workshops and retreats, nationally and internationally. 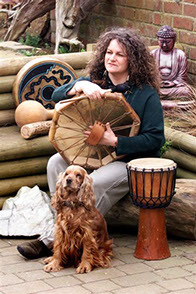 She also works extensively with the healing resonance of sound, incorporating the shamanic drum, Native American flute, singing bowls, voice and the gong to facilitate personal change, transformation and as a way of enhancing peoples life energy and their ability to express and communicate. Roz has always had a strong affinity with nature, wildlife and the earth’s natural energies. From a very early age she has experienced numerous psychic phenomena and through on-going study and practise Roz has enhanced her natural psychic and mediumistic abilities to a high degree. Her professional background in dance and exercise and as a tutor of national teachers training courses in health and fitness means she has developed a sound understanding of the physical body and is well experienced at working with groups to facilitate learning and co-operation using a range of teaching strategies. Roz has worked and performed with a wide range of international artists and has featured on both local and national radio and television. She has also had articles published in national magazines. Roz has taken her work to schools, colleges and universities as well as being invited to present at Mensa. She finds it both rewarding and stimulating working with such varied groups of people from the very young to the more mature and with differing levels of experience and ability. Adi has a wide and varied teaching background working as a national consultant, trainer and assessor in Health & Fitness, Stress Management & Well-Being, and work-related Conflict & Aggression Management. Having graduated from Loughborough University with First Class Honours Degrees in PE & Sport Science and Ecology, Adi has spent over 30 years working in education. He has deliverd training in both privae and public sector throughout the UK and abroad, as well as working in several colleges across the Midlands. Adi’s work has included being Course Director and Assistant Training Development Manager for London Central YMCA fitness training department in which he co-developed their personal training courses and walking programme. He also been a leading Trainer and Course Director for Fitness Wales, developing a wide range of courses including fitness assessment, business skills, training in different environments and level 3 personal training awards. Adi has worked with Reebok, Powersport, Leicester Tigers Rugby Club, Northampton and Milton Keynes Swimming Clubs, and is a keen personal trainer taking an holistic view to total fitness. Adi was a foundational tutor and course developer for the Suzy Lamplugh Trust Personal Safety training and consultancy working to identify and reduce work related aggression and violence. He curently works with his own company ‘Adiscott’ and co-works with ‘Worthwhile Training Limited’ delivering bespoke training courses in work related conflict & aggression management, stress management & well-being, and communication skills. Adi has developed a relaxed and very interactive delivery style that embraces all groups – from absolute beginners to elite, from youngsters to seniors. He combines his in-depth knowledge and coaching skills with a sense of fun to help people learn and enjoy. 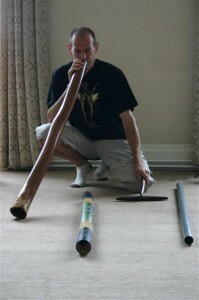 As well as co-creating sound baths, concerts and performances, Adi leads didgeridoo workshops and takes pride in guaranteeing that everyone can get a ‘toot’ out of the didge. He also presents a range of interactive workshops on Stress Management & Well-Being and Health Related Fitness.